Scientists have detected glimmers of awareness in some vegetative brain-injury patients and have even communicated with one of them - findings that push the boundaries of how to assess and care for such people. The new research suggests that standard tests may overlook patients who have some consciousness, and that someday some kind of communication may be possible. In the strongest example, a 29-year-old patient was able to answer yes-or-no questions by visualizing specific scenes the doctors asked him to imagine. The two visualizations sparked different brain activity viewed through a scanning machine. "We were stunned when this happened," said one study author, Martin Monti of Medical Research Council Cognitive and Brain Sciences Unit in Cambridge, England. "I find it literally amazing. This was a patient who was believed to be vegetative for five years." Ever since a research paper four years ago showed apparent signs of awareness in a vegetative patient - one who was included in the new study - families of patients have been clamoring for brain scans, said Dr. James Bernat of Dartmouth Medical School, a spokesman for the American Academy of Neurology. In fact, a spokeswoman for a patient advocacy group said the organization will urge families to ask about the type of brain imaging used by the researchers. 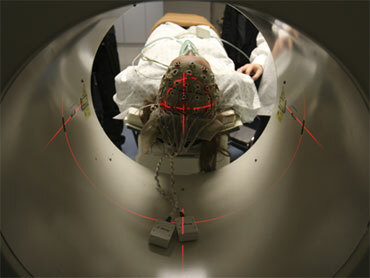 But experts said more study is needed before the specialized brain scans could be used routinely. "It's still a research tool," Bernat said. Experts also emphasized that only a few tested patients showed evidence of awareness. And they said it is not clear what degree of consciousness and mental abilities the signs imply. They also noted that the positive signals appeared only in people with traumatic brain injury - not in patients whose brains had been deprived of oxygen, as can happen when the heart stops. Terri Schiavo, the vegetative woman at the centre of a national controversy before her feeding tube was removed and she was allowed to die in 2005, suffered oxygen deprivation. The new work, published online Wednesday by the New England Journal of Medicine, came from researchers in Britain and Belgium. One author is Dr. Steven Laureys at the University of Liege in Belgium. He made headlines in November by showing awareness in Rom Houben, a 46-year-old man who had been diagnosed as being vegetative for 23 years. (Houben was excluded from the new study because he could not keep his head still enough in the brain scanner to produce a usable scan; his awareness was revealed by bedside behavioral tests). The new study used brain scanning called functional MRI, or fMRI, for 23 patients in a vegetative state and 31 diagnosed as minimally conscious. Patients are diagnosed as being in a vegetative state if they are tested and found unable to do such things as move on command or follow a moving object with their eyes. (Their eyes are open; in contrast, comatose people's eyes are closed.) Minimally conscious patients show signs of awareness, but they are minimal and intermittent. While in the fMRI scanner, the patients were asked to imagine two situations. One was that they were standing on a tennis court, hitting a ball to an instructor; the other was that they were navigating familiar streets or walking from room to room in their homes. The two tasks produce different patterns of brain activity in healthy people. The study found those patterns appeared in five patients when they were asked to imagine the scenes. Four of those patients had been diagnosed as vegetative. "It just says how much we can learn from looking directly at somebody's brain," Monti said. But he said the results cannot be taken to indicate how commonly a vegetative brain holds hidden signs of awareness. And the findings certainly don't mean all vegetative patients have that capacity, he said. The 29-year-old, who had been injured in a traffic accident, was asked simple questions about his life, such as "Is your father's name Alexander?" He was told to answer "yes" or "no" by thinking about one or the other of the imagined scenes about playing tennis or navigating streets or his home. For five of the six questions, his brain activity matched the correct answer. Monti and Laureys said it is not clear whether such patients have the mental capacity to answer more important but complicated questions, such as whether they wish to go on living. "I'm trying to figure out what is the best way to tackle this," Laureys said. Laureys also said fMRI technology isn't practical for routine assessments of vegetative patients or for enabling communication. So he is working to develop a more portable and less expensive approach based on sampling brain waves. Now that communication has been demonstrated, it brings an urgency to finding ways to capitalize on that ability, said Dr. Nicholas Schiff at New York-Presbyterian Hospital/Weill Cornell Medical Center. Schiff is collaborating with Laureys and others on such research. Some experts, like Dr. Ross Zafonte of Harvard Medical School, who was not involved in the study, said the brain patterns also don't reveal anything about whether patients have retained significant memory and other important mental abilities. "But it's provocative and exciting because this is a cohort of people that everybody had given up on, and now there's reason to say ... there might be something there to manipulate," he said. Maybe brain scans could identify patients with a better chance than others to improve with specialized treatment, he said. Susan Connors, president and CEO of the Brain Injury Association of America, an advocacy group, said the study means there's hope for people with brain injury. She said her group will now add fMRI testing to the list of things they recommend families ask about after a serious brain injury. Connors said some people might want to use such brain scans to help them decide whether to keep a loved one with a brain injury alive. But that shouldn't be the deciding factor, she said, adding that families are still going to have to rely on the person's wishes, religious and cultural beliefs and medical advice. "This is going to give us more information, but it's not going to give us the final answer," she said.